One of the greatest challenges facing Africa’s rapidly growing urban population is how to access sufficient, affordable and nutritious food. A pervasive rural bias that focuses on rural hunger and increased support of smallholder agriculture persists as the dominant feature of current thinking about food security policies. Promoters of rural development in Africa suggest that urbanisation is an inherently negative phenomenon that can and should be slowed, or even stopped, through judicious technocratic support of rural small farmers. 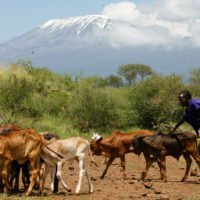 This romantic vision of pastoral Africa may provide a convenient rationale for institutional relevance, but it flies firmly in the face of reality. By next year, the urban population of developing countries is expected to exceed 50%. One of the greatest challenges facing Africa’s rapidly growing urban population is how to access sufficient, affordable and nutritious food. There is a major upsurge in levels and trends of food insecurity. Rates of both undernutrition and obesity are soaring, dietary diversity is declining and constant hunger is the lot of millions. Most cities are awash with food; the key issue is not how to grow more food but how to improve access to the food that is grown and available. Economic growth in many countries is far from inclusive with high unemployment rates, and precarious and informal employment the new norm. Very few national and city governments have developed food security plans for their burgeoning urban populations. One of the many complex challenges is the dramatic transformation in urban food systems over the last three decades. African cities are characterised by massive expansion in informal settlements and informal livelihoods. In most cities, the informal food economy comprises a dense and diverse network of informal markets, suppliers, transporters, mobile traders, hawkers, retailers and street food vendors who sprawl across the landscape, making food more accessible and affordable in low-income areas. In South Africa, whether poor households can access the food available for purchase in supermarkets and other retail outlets depends on two key variables: household income and the price of food. Income, or the lack thereof, drives urban food insecurity. Households that have one or more members in wage employment tend to be more food secure than those that do not, or those that rely on other income streams such as casual work, social grants or renting out accommodation. South Africa is one of Africa’s most urbanised societies, with about two-thirds of its population living in urban areas. In 2002, the government adopted an integrated food security strategy that was guided by seven strategic objectives that included to increase household food production and trading; improve income generation and job creation opportunities; and improve nutrition and food safety. While these objectives went a long way towards capturing the integrated nature of food security, the strategy was inadequately implemented because it was housed within the Department of Agriculture where it was subjected to rural bias and an oversimplification of the problem as one of the food supply. This policy implementation’s failure to grapple with food security beyond concerns about food production represents a failure by one of the most economically advanced countries on the continent to overcome the narrow view of food security. By contrast, the 2013 National Policy on Food and Nutrition Security includes only four points in its strategy: better targeting of public spending on social programmes; increased food production and distribution; support for community-based food production initiatives; and the strategic use of market interventions and trade measures to promote food security. It is of great concern that policy makers appear to be narrowing their view of food security even as the country continues to urbanise and the structural inequalities in its cities continue to weigh down social, political and economic progress. At city level, there are few, if any, examples of coherent policy responses to the management of urban food systems in the interests of the poor and food insecure. Cities such as Cape Town that have initiated a process to develop a food security strategy have then abandoned the effort. Any progress towards addressing urban food insecurity in a substantive manner will probably be indirect, through the actions of the influential global nutrition lobby. Nutrition highlights the food security pillar of utilisation and has begun to make an increasingly important contribution to the global food agenda, reinforcing the argument that food security is a multi-sectoral problem that is far more complicated than simply growing more food. Nutrition narratives are increasingly linked to urbanisation through concerns about the double burden of nutrition with rising obesity rates and consequential rises in non-communicable diseases such as diabetes and heart disease. There is a risk of oversimplification of the causal connections between urbanisation and changing diets because urban food systems are not only shaped by consumer demand but also by the systems that supply certain foods to the cities and other aspects of urban culture that shape preferences. Obesity in urban areas is found in both low and high-income communities. Jonathan Crush is the 2018/19 University Research Professor at Wilfrid Laurier University, Waterloo, Canada. He is director of the Hungry Cities Partnership, the African Food Security Urban Network and the Southern African Migration Programme. This article by Jonathan Crush was first published on Daily Maverick on 30 January 2019.